Aninaandag or balsam fir (Abies balsamea (L.) Miller) is a common tree across much of the northwoods. 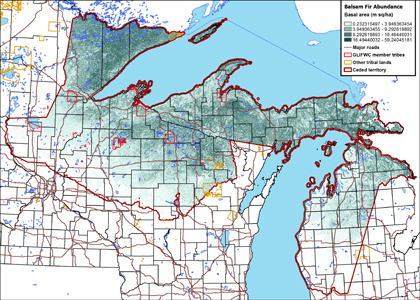 It is is usually a major component of conifer swamps and floodplains, but also inhabits upland northern hardwood-conifer forests, where it usually occurs as an understory tree. Farther north it becomes a dominant tree (along with jack pine and black spruce) of the boreal forest. Harvesting balsam boughs for sale to local and regional businesses that specialize in wreaths and other Christmas decorations is an important source of income for many tribal members and other northwoods residents. A tiny insect called the balsam woolly adelgid (Adelges piceae Ratz.) or BWA for short, poses a serious threat to balsam fir and other North American fir trees. This tiny relative of aphids (or “plant lice”) arrived on east coast of North America over 100 years ago, on nursery trees from Europe. It is now well-established in New England and southeastern Canada, with outlying populations in the Appalachians. It is also established on the west coast. A significant risk factor for the introduction of the BWA to the ceded territory may be Christmas tree farms. These farms sometimes obtain seedlings from fir seedling growers in the southeastern US, where the BWA is already established. Along with farming in general, Christmas tree farms are more abundant in the southern and central portions of the ceded territories. 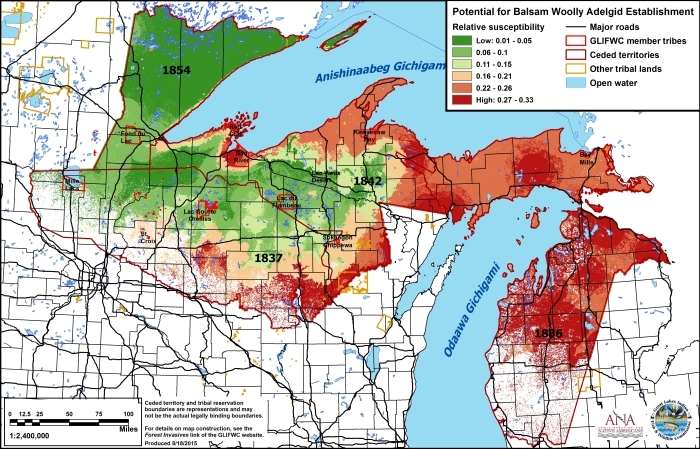 Therefore Fond du Lac, Mille Lacs, St. Croix, Lac Courte Oreilles, and Sokaogon Chippewa tribal lands may be at greater risk for BWA infestation than lands further north. A study done in infested areas in Nova Scotia and New Brunswick, Canada (Quiring et al. 2008) found that in areas with a mean January temperature of 12°F (-11°C) or colder, the BWA did little damage to balsam fir, while in regions where the mean temperature was a degree or two warmer, balsam fir were significantly damaged. 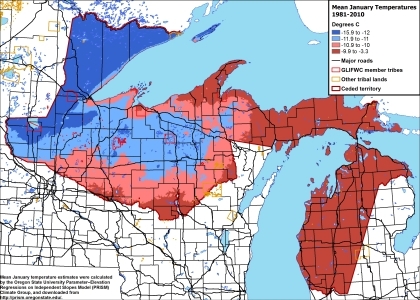 The 12°F mean temperature line (between red and blue) almost divides the ceded territory in half, with the northern and western half colder than 12 degrees F, and the southern and eastern half warmer than 12 degrees F.
This simple risk map for balsam woolly adelgid introduction and survival was calculated using data for balsam fir abundance shown above, along with mean January temperatures across the region and distance to nearest Christmas tree grower. The western part of the ceded territory is colder on average than 12°F in January, and may protect Aninaandag from serious damage in the near-term. Even a relatively small increase in winter temperatures due to climate change would quickly put much more balsam fir at risk, though. 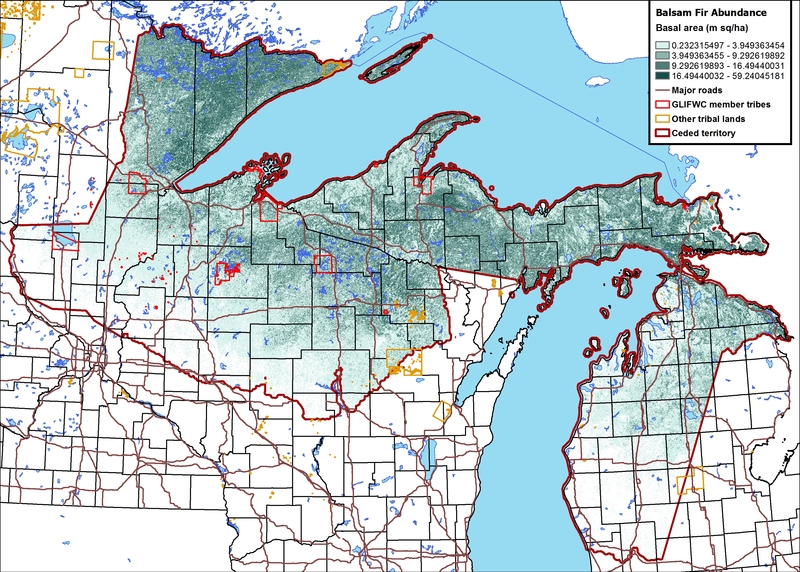 Though a bit dated, this 11-page US Forest Service leaflet (Ragenovich and Mitchell 2006) gives a very good overview of the BWA and its impacts on fir trees in both eastern and western North America. Includes good photos of the symptoms of infestation and impacts of the BWA.